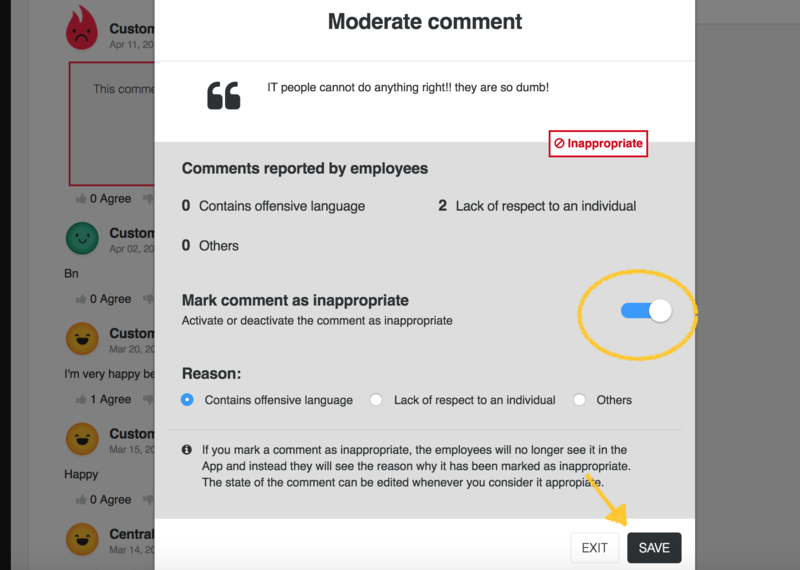 What should I do when an employee makes an inappropriate comment? This is an unusual situation but if an employee makes an inappropriate comment like disrespectful jokes, personal accusations, etc. we need to be prepared. 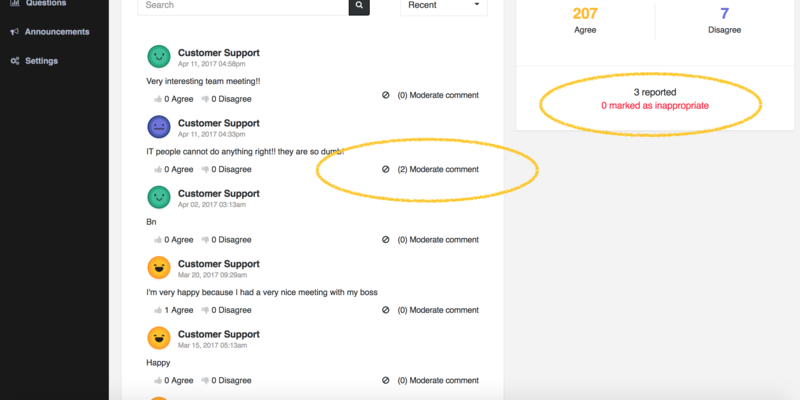 The Happyforce community (your registered employees) can take action and moderate the conversation themselves, marking a comment as inappropriate. Next, they will see a menu where they will be able to choose among three options explaining why they consider the comment as inappropriate: it contains offensive language, it's disrespectful towards another individual, or for other reasons. This information is also shown in your Dashboard. Moreover, you can select your comments by inappropriate and see them all. How can a comment be withdrawn? If a sufficient number of employees mark a comment as inappropriate, it will be withdrawn immediately. Each company decides its threshold to make a comment disappear but normally it is in between 10 and 15 employees. If you need to withdraw a comment immediately, you can also do it manually from the Dashboard if you are an Administrator. 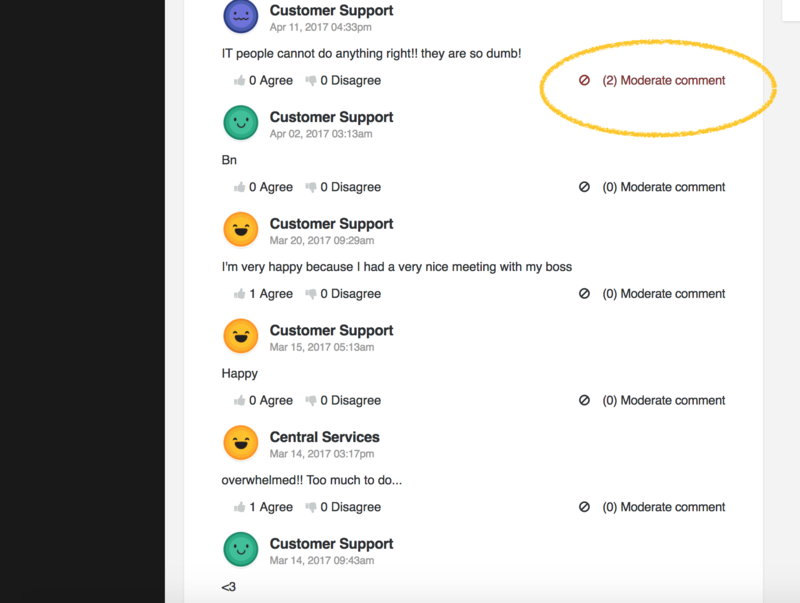 To do this, you only need to click on "Moderate comment"
You will then be shown a menu with a "Mark comment as inappropriate" option, and as soon as you mark it the comment will no longer be seen by employees. What happens when a comment is withdrawn? The comment will not disappear completely from the timeline but instead a poster will indicate why it has been marked as inappropriate. 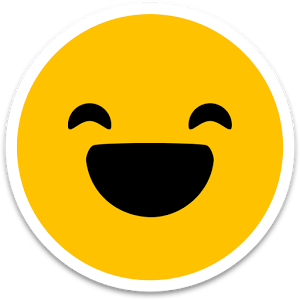 This way it can be used as an opportunity to send a message to reinforce your corporate culture, which should include positive behaviors and messages related to your organization's values.